Following this, we watch little Arthur grow up before our eyes in a very Guy Ritchie-style expository montage. His entire youth is summed up by him becoming gritty with a chip on his shoulder. And fighting. Lots and lots of fighting. You can see the pattern. The film races by at a clip that brushes over important moments of character building. Story beats pass by too fast for anything to feel relevant or for the setting to feel adequately lived in. Still, the film manages to slow down for exposition dumps and redundant flashbacks. The pacing of the film, thus, is inverted from what is expected. The film makes it clear that there are few things you need to know. Vortigern is a fascist ruler with a black heart. We don’t know why, nor are we asked to care why. I mean, we are given backstory as to why, but that isn’t character construction. Arthur is the big-heartedest pimp in the kingdom. He is pure of heart not by character, but by audience preconception. But, again, we are not asked to care about this. We already are expected to know the King Arthur tale, so the movie brushes past giving Arthur a personality beyond the archetypal Ritchie dry wit. So plot is favored over character: so what? An audience won’t care. This is a Guy Ritchie medieval action flick. They’re not here for depth! Sure, there is action. Largely, it is captured well, save for some shakiness, some blurriness, and a lot of rapid pans and zooms. Frenetic and energetic as it is, the stakes of the moments are not always evident. Few goals become complicated in the known arc of the story—that Arthur will ascend to the throne that is rightfully his. The pressure and adversity of challenge is replaced by a sort of smugness in stylization. While this works in Ritchie’s more tongue-in-cheek pictures, here it seems out of place. The film does benefit some from that Ritchie energy. His brand of sardonic humor adds levity to a too-often droll genre. This just isn’t enough. 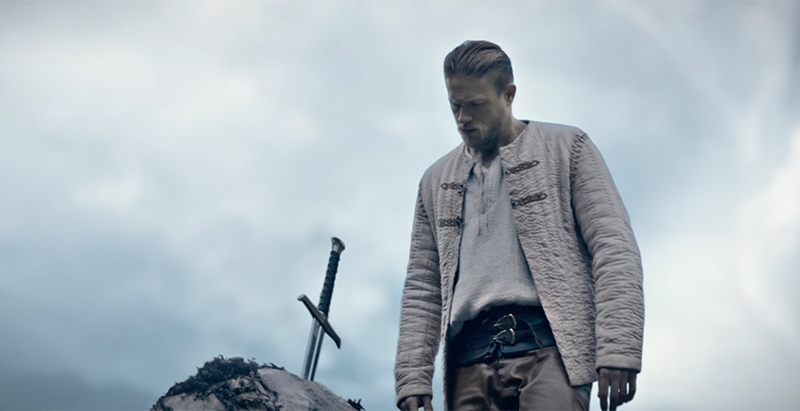 Witty and humorous as it is, with one or two set pieces worth attending the eyes to, King Arthur: Legend of the Sword suffers from its stylized pacing issues and uninspired use of source material. i just saw an early screening and was greatly entertained, which is what I wanted from this film. The story was fun and the acting was well done. A great fantasy film. I wasn’t expecting an Academy Award winner here. I think the shakiness and blurriness was intentional. As for all the character building, the movie would have run another 30 minutes. And unless you’ve been living on Mars, you know the basics of the Arthurian Legend, so of course Richie assumes moviegoers aren’t Martians. As for the humor being out of place, I thought it fit just fine, since the story is entirely a fantasy and not the medieval version of Lincoln or remotely close to Le Morte d’Arthur. If you want a Charlie Hunnam film that fits this critic’s idea of great cinema, go see Lost City of Z. Want a fun, entertaining fantasy film worth the money, this is great. i give it a B, B+ as in billion, which is what this film will likely earn since I think most people aren’t expecting high art here. I think the Clive Owen King Arthur was more realistic scenario. A British born Roman officer helping save a country and form the British nation. I’d like to know how two black men and a Chinaman happend to be in 6/7th century England. The Romans had both Asian and African slaves, some of whom were attached to the 20th Legion which was permanently stationed in Britannia until Rome withdrew in the mid 5th century. Some of them were freed–a common practice among the patrician class in their wills–and settled there. After centuries of intermarriage with Britons, Saxons, Danes and Norse, the Asian and African appearance would have all but disappeared by the 11th century when William the Conqueror arrived from Normandy. So it’s not so unbelievable. Plus, North Africans were excellent seamen and were known to have traded with Roman Britannia. Some may have settled families there as business agents in ports like Londinium and Isca.